Contd. from 29 April, 2018: 4. Manglen: The ‘Manglen’ is still near a ‘fig tree’ covered by a stone-plate. It is situated in the eastern direction from the ‘Kangla Men Surung’. Before hinduisation in Manipur, the skull of the kings were buried here. After conversion into Hinduism in Manipur the dead bodies of the Meitei kings were cremated anywhere but after cremation their ashes were buried here in unbaked earthen posts. This practice is known as ‘Manglen Chanba’. 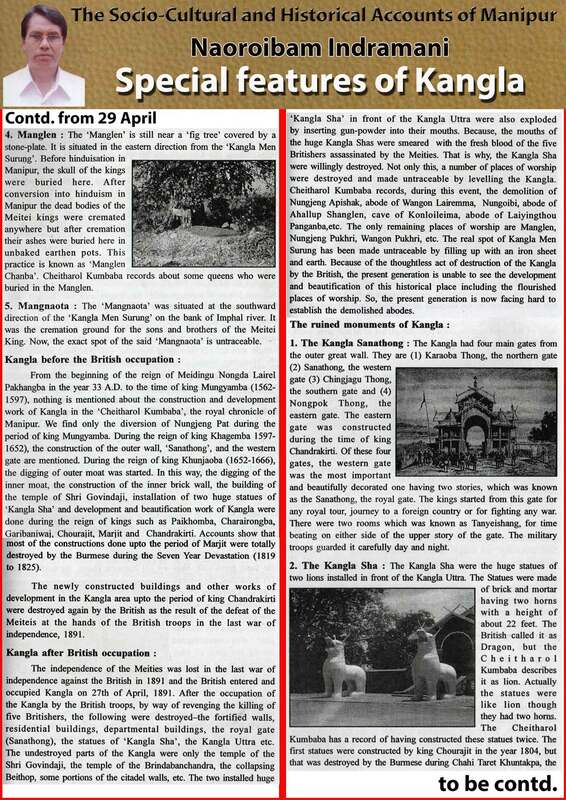 Cheitharol Kumbaba records about some queens who were buried in the Manglen. 5. Mangnaota: The ‘Mangnaota’ was situated at the southward direction of the ‘Kangla Men Surung’ on the bank of Imphal River. It was the cremation ground for the sons and brothers of the Meitei King. Now, the exact spot of the said ‘Mangnaota’ is untraceable.